A scene from Otto Piene’s “Sky Event” at MIT’s Killian Court, on view at Boston Cyberarts Gallery. “The largest canvas we have is the sky,” says Otto Piene, the visionary artist and former director of MIT’s Center for Advanced Visual Studies, in “Otto Piene’s Sky Art,” a 2010 video by Vin Grabill. Piene, who died last year at 86, is a key figure in the technological art boom in this region in the last third of the 20th century. “Otto Piene & Electronic Art in New England” at Boston Cyberarts Gallery celebrates the artist’s audacity and his sense of fun. His passion for spectacle — realized again and again in a high-flying series he dubbed “Sky Art” — encouraged collaboration and fostered community. The artist, a German, was a founding member of ZERO, a highly collaborative and experimental international artists group spotlighted in “ZERO: Countdown to Tomorrow: 1950s-60s,” which closed last month at the Solomon R. Guggenheim Museum. Piene settled in the US in the mid-’60s, and in 1967, György Kepes, CAVS’s founder, invited him to be the center’s first fellow. He took the director’s job in 1974. There’s only one artwork by Piene in “Otto Piene & Electronic Art in New England.” “Electronic Light Ballet,” a made-for-television piece broadcast on WGBH’s “The Medium Is the Medium” in March 1969. It was the first format for made-for-television-art in the US. “Electronic Light Ballet” is a product of its time, with nods to psychedelia and the space age. By today’s standards, it looks awkward and dowdy, but in 1969, it was revolutionary. Piene created a grid of squirming lights by cutting holes in plywood, shining a light through at the camera, and moving the wood. In a double exposure, a woman in a jumpsuit, helmet, and harness is seen lifted by a balloon illuminated with streams of light. The rest is all documentary, plus an inflatable tribute by John Powell in the front window, with images projected on it from Piene’s final piece, “Proliferation of the Sun.” On a sunny day, the projections are nearly impossible to see. 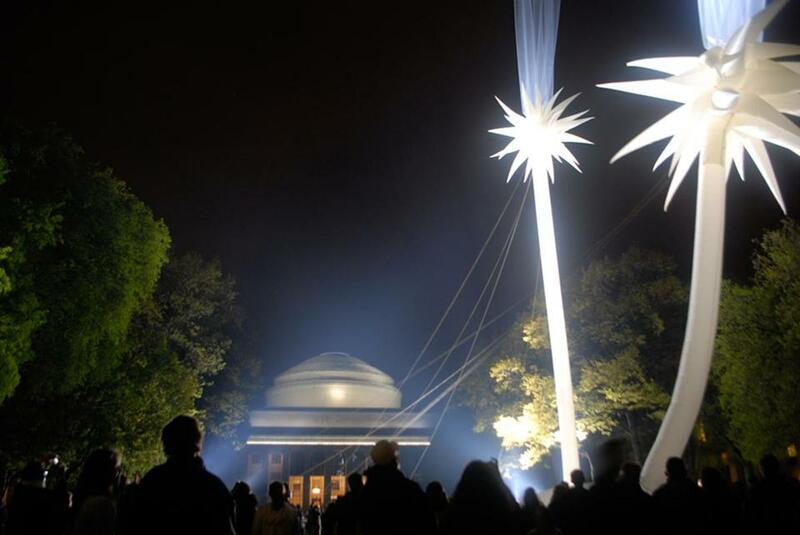 Piene’s sky projects, lighthearted and often luminous, brought together hundreds of collaborators and even more audience members. A spirit of community infused his public art. He was at work in Berlin on “Proliferation of the Sun” when he died last July. Two events at the gallery this week highlight the hotbed of electronic art in this area in the late 20th century: a panel talk about CAVS tonight, and a discussion tomorrow with Fred Barzyk, the former director of WGBH’s New Television Workshop. Barzyk tapped the talents of such artists as Nam June Paik and Allan Kaprow as well as Piene. Both events are at 7:30. The talk on Thursday requires registration; for info, see www.bostoncyberarts.org. “Super Maria” by Anthony Montuori, part of “The Power of Negative Thinking” at New Art Center. “The Power of Negative Thinking,” a cheeky group show with a serious undertow at the New Art Center, might be devastating if it weren’t so humorous. Not all the work hits the spot, but when it does, you sense that spot crumbling beneath your feet. Anthony Montuori’s video games, perpetually cheery in their tone yet bleak in their message, use old game formats to explore societal and existential suffering. 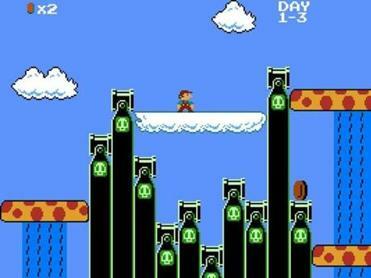 “Super Maria” looks exactly like “Super Mario,” but the protagonist simply has to go to work each day in order to collect a paycheck. If she’s lucky, she’ll be able to pay her rent. Borrowing from the pure saccharine of certain greeting cards, Randy Stevens makes paintings with fluffy, heartwarming images and nihilistic greetings. One is sky blue, painted with pink roses and covered with glitter. 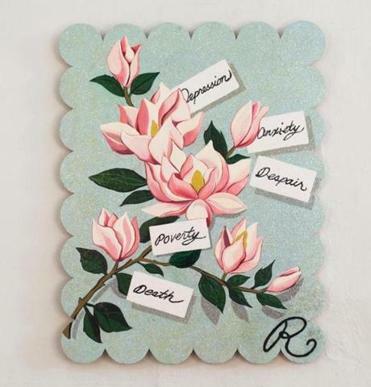 Its message: “Depression, Anxiety, Despair, Poverty, Death.” Cheer up — the end is nigh. Stephen St. Francis Decky’s installation of hand-sewn plush animals and paintings featuring those critters is harder to read, but that ambiguity is freighted. His characters don’t smile or frown — their mouths are generally straight lines. In the paintings, they appear to be surrounded by sunsets and lollipops. Occasionally, a hint of menace arises, as devils and serpents appear. That sets the alarm bells ringing for the viewer, while the characters remain oblivious. “Depression, Anxiety, Despair, Poverty, Death” by Randy Stevens. That dark ambiguity appears again in “Don’t Wish It Were Easier, Wish You Were Better.” The title is an unnerving slogan artists Bradley Tsalyuk and Corey Dunlap borrowed from a motivational speaker, emblazoned on a banner, and suspended in the air with smiley-face balloons. It might mean you can do better. It might simply mean that you stink. The smiling balloons are losing helium during the course of the exhibition, and the banner is sinking to the floor. They are the metaphoric equivalent of a motivational speaker: nice packaging, uplifting message. It may change things for a few days. But the balloons always sink. “The Power of Negative Thinking” examines how social niceties overlay real pain. Thank heaven it’s so funny.